It's not often you show up to a golf tournament and have no idea of the format. But that's exactly what players experienced this week at Fairways Golf Club in Florida. The club hosted what it labeled the Top Secret Tournament, a two-day event with a mystery format. On Day 1, the players played a typical, stroke-play format. Not a real mystery. But it was on Day 2 that the twist was revealed. That morning, the players were told they'd play Round 2 on the exact same course set up the exact same way, with one very important diference: The traditional 4 ½-inch cups would be replaced with 15-inch cups. The results were illuminating. Of the 80 players who completed both rounds, 68 improved their score with the 15-inch cups, including 32 who improved by at least 10 shots. 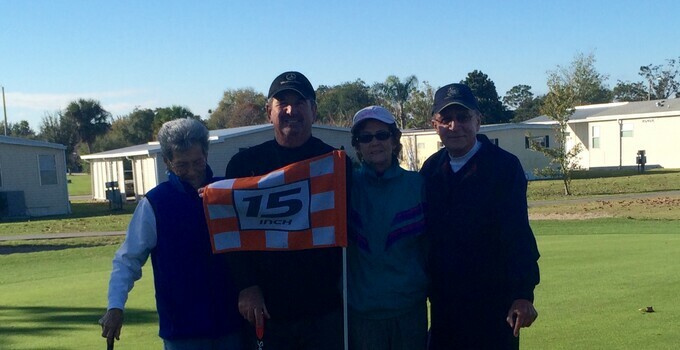 The tournament's lone hole-in-one came on Day 2, from 143 yards at the par-3 sixth -- the first of John Caforio's life. There were three other hole-outs for eagle from the fairway and another 19 chip-ins from off the green. Some 23 players recorded the round of their life with the larger cups. A number of players said it was the most fun they'd ever had playing golf. The 15-inch cups may not be for every golfer, but this experiment shows a good number of them can have a great time with a bigger target.